For more than seven years, Rajesh Sharma has been taking classes for children in New Delhi. He teaches English, Hindi, science, maths, history and geography. Oh yes, I forgot. He is actually a grocery shopkeeper. And there is no actual school here. 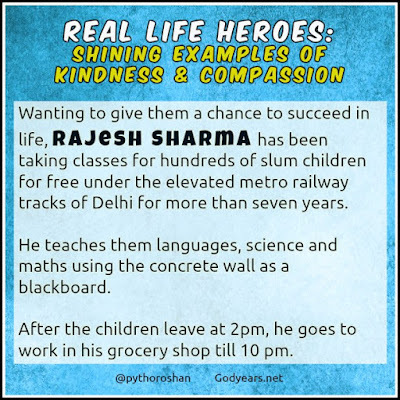 You see, Rajesh Sharma holds free classes for hundreds of slum children under the elevated tracks of the Yamuna Bank Metro station. In 2007, when the bridge was under construction, the 45 year old saw the children of labourers playing in the mud and asked their parents why they were not going to school. Their answer - financial constraints - struck a chord in Rajesh's heart, having had to drop out of college himself for similar reasons. So he decided to so something about it. With just one wall blackened with paint as a blackboard (the concrete section of the railway bridge), Rajesh began to take classes every morning for the children of these labourers. Initially there were just 2. Today, there are 200. With no government funding, the 'school' is dependent on the kindness of fellow Indians, with donations of books, footwear, clothes, sports equipment and food. Rajesh even keeps a day aside - Saturday - where it is all about games with cricket, football, badminton etc. Today, volunteers including Anshul Gupta, a student studying law at Amity university and Umar Imam, an IIT-Delhi graduate, come by and volunteer up to 4 hours daily for the children. Even Rajesh's own son, presently in Class 11, drops by to teach occasionally. The Metro authorities helped too, constructing platforms for the teachers to stand on while teaching as well as painting five blackboards on the wall. Realizing that there is no validity to his classes, Sharma encourages the children to join government schools and has even made arrangements with the principal of a nearby school to admit 60 of his students. The class under the bridge ends at 2 pm for the children but Rajesh's day is only getting started as he goes to his grocery store where he works every night till 10 pm. 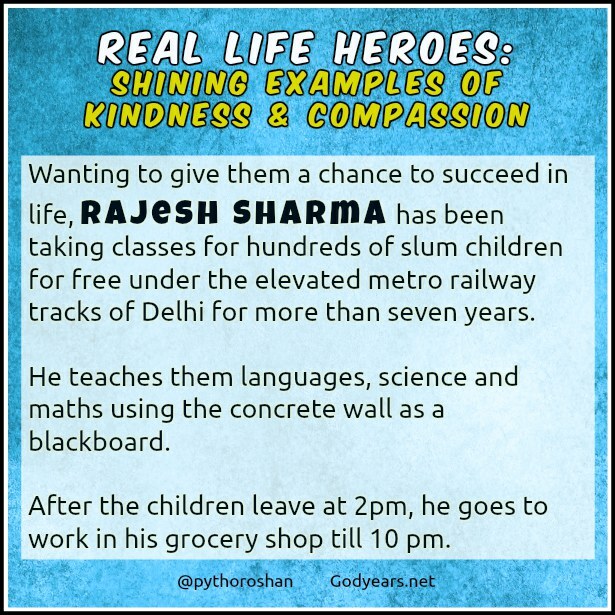 Rajesh Sharma has taken money, time and geographical location entirely out the equation in his selfless quest, doing everything humanly possible to impart education and give these slum children a better chance to succeed in life with his amazing selfless acts. Wow! Such a kind souls he is. Education children is helping them make India's future. Thanks for sharing this story and I'm inspired to see that you will always have time for what you believe in. A grocery shop owner making such a BIG difference in the lives of so many kids, and that too without any support and infrastructure... this is TRULY inspiring. His story goes on to prove that where there is a will, there is a way! Yes, I've heard of this man. The best thing about these stories is, how these people did these truly great things only because they *wanted* to do something *right*. The intent and the willpower makes all the difference. Proud of my fellow Sharma :) Noble act indeed! Very inspiring and selfless act. Goodness is purely intent based. Rajesh is doing a very noble thing by teaching these kids. I salute him for his intention and Goodwill. 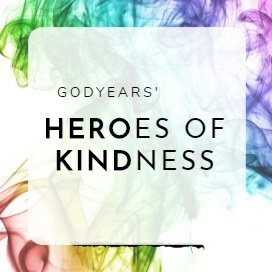 It needs passion and a heart of gold to beat all odds, and be resourceful in helping the needy. We is building the lives of all these kids. What an amazing man! Wow! 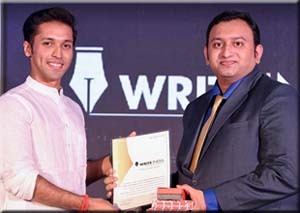 Finally a fellow Indian to be proud of after all your posts on kindness from across the globe. Rajesh seems to have made the most of what he had despite his constraints. Who would have thought of running a school out in the open like this? Truly inspirational. Sometimes I think money, time and status are nothing but obstacles to our dreams. 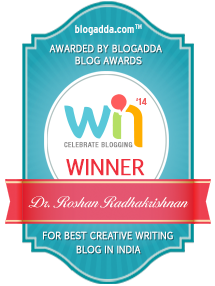 Its people like Rajesh to prove that you need only "will" to do something. Everything else follows. So inspiring. While other people dream, Shri Rajesh Sharma has actually achieved it. 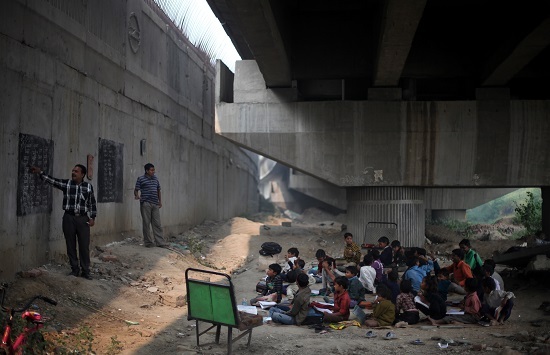 Free education under the bridge is such a noble endeavour. Why can't India award such people instead of the movie actors and cricketers? People like this deserve to be worshiped. You are seriously doing a great job! Knowing about Rajesh is a proud feeling in in itself. Thanks for sharing real life heroes with us. Rajesh is a real life hero. Someone who is selflessly doing something and inspiring others to volunteer their time and effort for this noble cause too. And for a change the authorities are also supporting him - or maybe I am being too cynical! I really wish these kinds of stories would make it to the front pages of newspapers, so that we all wake up to positivity instead of being bombarded with hate and corruption. Wonderful! Education is one of the best gifts that you can give to others. 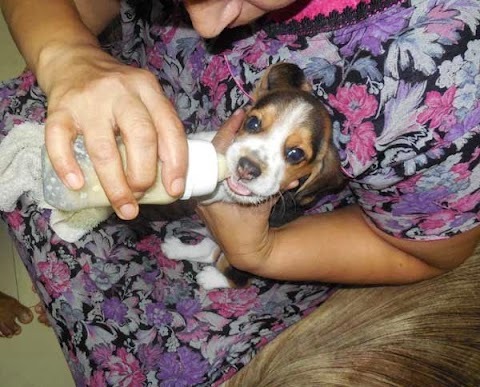 It is really wonderful to know that a person has found ways to help the kids like this. I salute him for his efforts and altruistic attitude! It's really gratifying to teach someone and here he is doing such a noble thing! Awesome. Selfless and noble. Fullfilment and happiness comes in giving without any expectation and making a difference in someone's life. Hats off to him. Salute to this hero. He is doing such a selfless act and also a kind service to the nation. Living in Delhi and taking out the time to impart knowledge that's not an easy task. Indeed Rajesh is doing extraordinary in ordinary environment. Wow i am truly touched by his story i wish i can do something similar some day!!! Ask me how tough it is when it comes to mobilizing funds for a project. I actually had to drop a project where I was planning to go basic skin and ENT treatment of over 3000 Jail inmates/undertrials in my area through our NGO. I had to actually drop the project for lack of funds. It is always a lonely battle. Appreciate the gentlemans efforts and Thank you for bringing this out. Respect!! This Indian is truely an inspiration for many in this country. Hopefully the example will inspire people to divert some of the funds for betterment of society, which starts from Children.